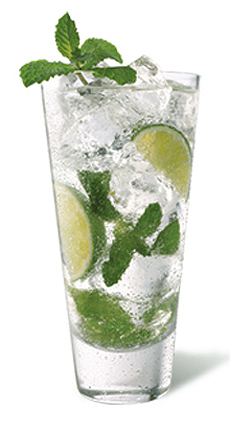 The Mojito: tall, cool and minty. Photo by Paul Johnson | IST. This is Page 3 of a three-page article with popular Latin cocktail recipes; here, a Mojito from Cuba. Click on the black links below to visit other pages. 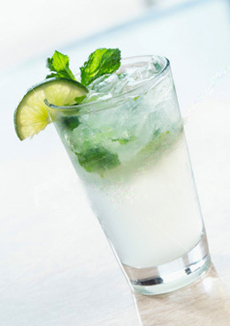 The mojito (mo-HEE-toe) is a quintessential Cuban cocktail. The name derives from the African voodoo term mojo, to cast a small spell. According to Bacardi Rum, the drink can be traced to 1586, when Sir Francis Drake and his pirates unsuccessfully attempted to sack Havana for its gold. His associate, Richard Drake, was said to have invented a mojito-like cocktail known as El Draque that was made with aguardiente, a crude forerunner of rum, sugar, lime and mint. Around the mid-1800s, when the Bacardi Company was established, rum was substituted and the cocktail became known as a Mojito. Place the mint leaves into collins (highball) glass and squeeze the juice from a cut lime into it (a single lime may provide more than 2 ounces). 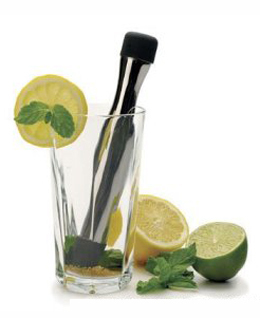 Add the powdered sugar, then gently smash (muddle) the mint into the lime juice and sugar with a muddler (a long stainless steel device pictured below, though you can also use the back of a fork or spoon). Add the ice, then add the rum and stir; top off with the club soda. Garnish with a mint sprig. Buy a muddler for crushing mint and other cocktail ingredients. Shake rum and mojito mix together with ice. Pour into a highball glass and top with a splash of club soda or seltzer. Garnish with a sprig of fresh mint, wedge of lime and a sugar cane stalk. Mojito. Photo courtesy El Jimador tequila.